Updating and expanding the materials from the first edition, Anomalistic Psychology, Second Edition integrates and systematically treats phenomena of human consciousness and behaviors that appear to violate the laws of nature. The authors present and detail a new explanatory concept they developed that provides a naturalistic interpretation for these phenomena -- Magical Thinking. For undergraduate and graduate students and professionals in cognitive psychology, research methods, thinking, and parapsychology. "Those interested in social psychology or personality will also find the book useful, perhaps not so much for the particular topics covered as for an introduction to the fascinating question of why anomalistic phenomena and magical explanations are so ubiquitous in human societies." 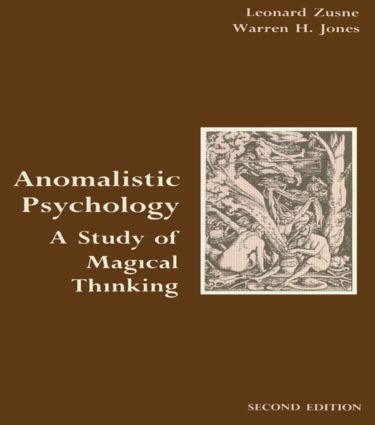 "As before, the great strength of Anomalistic Psychology is its range of coverage both of types of anomalous phenomena and of psychological concepts that might account for them….The book is generally excellent as a sourcebook of references…plenty of fascinating and informative material." "The book is recommended for both libraries…and…Upper-division undergraduates and up." Contents: Introduction to Anomalistic Psychology. Magical Thinking. Psychophysiology. Perception. Divided Consciousness and Imagery. Memory. Cognitive Processes. Personality. Beliefs. Psychopathology.